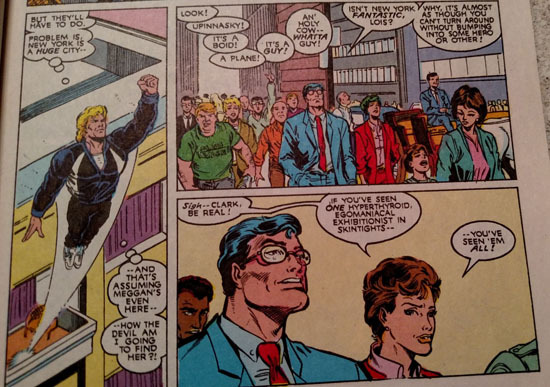 In Marvel Comics’ Excalibur #8 (cover date: May 1989), two well-known DC Comics characters show up in New York: Clark Kent and Lois Lane. As Captain Britain goes flying by, some onlookers even use the lines: “Look! Up in the sky! It’s a bird. It’s a plane!” which were made famous from the introduction to the live-action Adventures of Superman television series from the 1950s.